Tokolosh is a Manchester indie-supergroup featuring Liam Frost, Nathan from The Whip and Christian of the much-missed Earlies. After a series of singles over the past two years, their debut album finally gets a digital release this week with vinyl to follow in September. The album features all of the nine tracks off those singles plus four previously unreleased recordings - Hybrid, Defrance, Moogalosh and Ocean Outro. There's a very epic feel throughout the album, Frost's voice is equally suited to this band front man role as it is to his solo career which is focusing more on the acoustic elements of his songwriting. His almost angelic voice at points stands in juxtaposition to the dramatic backgrounds his bandmates create, taking him down routes not previously explored in his two excellent solo albums. There's a lot of variety to it as well - it jumps effortlessly from the glorious brass-soaked and keys-drenched instrumental Hybrid to the experimental fun and bizarre vocal sampling of Moogalosh and Ocean Outro (which concludes with some very unusual tribal drumming) through the calmer more introspective TokoHorse before concluding at the slightly warped takes on indie pop of Shapeshifter, Defrance, Bloodlines and last single A Great Wave. It's the two longest songs on the album however that are the main highlights on an album devoid of low points. Weighing in at over five minutes, Unknown Animal has enough ideas crammed into it for an album in its own right. It's a trip through a whole range of influences before ending with an extended instrumental section with vocal harmonies and a male banshee wailing. Quivering Pines has a similar modus operandi, starting with a subdued backing allowing Liam centre stage before sounding in (different) parts like movie soundtracks building to the critical scene before dropping back down towards a melancholic hushed ending. It feels like a record made by a band doing it for the joy of making music rather than one trying to make a living selling albums. It's most certainly not a Liam Frost and friends album, it sounds and feels like a genuine collaboration of five equals, which isn't surprising when its genesis comes from the friendships and sibling relationships (Nicky and Christian are brothers) built up around the Manchester music scene. Stay Strong is out now digitally and can be purchased from iTunes and Amazon. Jack To Phono Records plan to release it on vinyl in September. 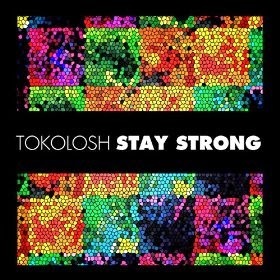 Tokolosh's official site can be found here. They are also on Facebook and Twitter.